In my last post I had mentioned a few lessons from my grandma. The post actually started as a lessons learned from both of my, let’s say “unique,” grandmas. But writing about both of these interesting ladies, who mean so much to me, was too big of a task to take on. Well since my last post, my other grandma passed away. During a recent trip, I received a text that grandma fell and broke her hip and died an hour later during x-rays. She was battling dementia, so in many ways it was a blessing it went fast. I think she was ready to say goodbye awhile ago. I also know how lucky I was to have had 46 years with two grandmas (and hopefully many more with the remaining one). Grandma liked being the center of attention. She would get a kick out of being on the Web. During my writing, it hit me that I also am genetically predisposed to dementia. If that happens, maybe someone can pull up my blog and I can at least read about my past. It lets me “cheat” a bit by reusing content I already wrote and I can now say “It is your turn, Stormy!” Let’s call it being efficient. I have never given a eulogy. I am not sure if there are “normal” requirements or expectations. I did try Google, the answer to everything. But anything I found sounded formulated, wasn’t personal, and didn’t sound like me nor like her. So, you are stuck with what I came up with on my own, which is simply sharing some memories. It may not be right (if there is a “right”) so bear with me…Grandma would have. She sat through countless shows, including costume changes, put on by my sister Kristin and me through the years. And always pretended to love them, no matter how awful the performance. 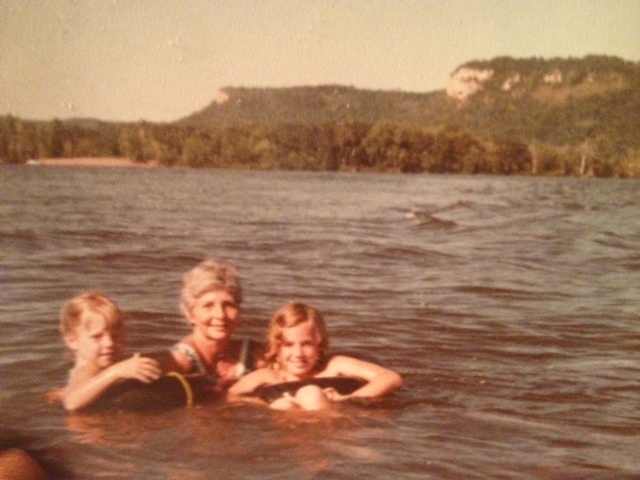 So much of my, and Kristin’s, childhood is wrapped in memories of grandma. We spent a lot of time there. With parents who were divorced and moved often, being at the cabin with grandma and grandpa was one of our few constant settings. With a setting like this, how can you not love being at Grandma’s! Now, if you know my grandma well, you can probably imagine she wasn’t the typical grandma characterized in storybooks. Though, she did bake the most incredible pies. Even when she got to the point where she didn’t have much else in her house when we came to visit (and we actually preferred she didn’t cook), she still would have a freshly baked fruit or pecan pie waiting for us. And yes dad, the pies for us continued long after she stopped having them waiting for her sons. Grandma wasn’t always easygoing. Actually, she could be a bit difficult. The best way to describe it is that she acted like a child. Grandma spoke her mind, often without thinking. She liked things to be centered around her own needs. Often she would cut off her nose to spite her face, for example hiding in her bedroom pouting when she knew we would be leaving the next day versus just enjoying the day we actually had left. But on the flipside, that same childlike essence is what made her magical to her granddaughters. No other adult would sit on the floor playing paper dolls or Barbies. And really playing, not just the distracted act of playing that most adults do to keep kids occupied. She immersed herself in our play. In the mornings, we could crawl into her bed and entertain each other by taking turns making up silly stories with us three always as the star characters. She understood little girl fantasy play and made our pretend world better, whether by providing scarfs and fancy skirts (Kristin, remember the pink poodle skirt and black lace Flamenco one?) or by showing us how to use the radio on the wall as an intercom to improve our game of being Charlie’s Angels. At the sandbar, grandma would help us “plant trees” – which meant finding big sticks, poking them in the ground and watering them. I could go on and on, because for me, the majority of my memories as a little girl include grandma. I was happy there, and I knew I was loved. She gave me a stable place to revisit and build memories upon. And, she was fun. As we got older, busier, and independent our visits became less frequent. But besides being a family gathering place for Dad, Shari and Mark, visiting grandma also continued to be our special girls’ place. My sister Kristin even held her bachelorette party there. Grandma and the girls celebrated at the Pioneer Club on karaoke night. I can still picture Grandma’s big smile and hear her laugh the next day as we teased her about the guy who tried to pick her up. Another time we brought our friend Elizabeth down to visit Grandma with us. We had a fashion show as Grandma pulled out all of her fantastic clothes. (The dress I have on is from that day and Elizabeth still wears a couple of pieces she adopted that day too.) One time, we sat in the basement looking at her old photos and teasing her about the comments she had written on them. How her legs were looking pudgy, or that is a bad angle for her versus anything about the cute baby that sat next to her. What I remember most about those times is all the laughter. We would always get each other laughing till our jaws hurt and tears rolled down our face. Grandma had a great laugh. When I first faced I was losing Grandma, to age and dementia, I was playing three-handed pinochle with her and Kristin. We grew up with cards at the cabin, and my sister at four would use a tinfoil box to hold her cards. This time, however, in middle of the game, grandma stated that she had never played pinochle before. That was hard. I didn’t want her to forget me. The times when Kristin and I were able to visit her in the hospital these past couple of years, anytime she would remember something about us girls–when we could get her to crack a smile about our past memories, or see interest pique at “girlie things” like the fake eyelashes we had on–those were the times I had my grandma back again. Thank you, Grandma, for so many moments. I love you.